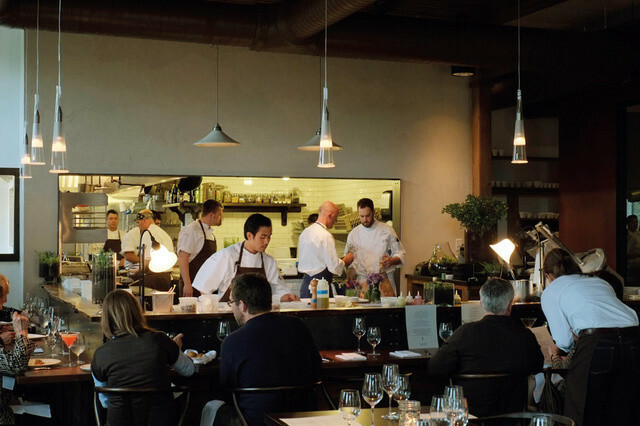 The opening year of wine country's most ambitious restaurant was a bumpy ride. Will a new chef and casual bar menu change things in 2013? After a turbulent seven months of both high praise and setbacks, Dundee's modernist-leaning wine country restaurant Paulée is heading into 2013 with a new plan. As reported in December, opening chef Daniel Mondok has left the kitchen, and former sous chef Sean Temple (formerly of Alu, Paley's Place, and NYC's iconic Jean Georges) has stepped into the leading position. What happened: From the beginning, reports were mixed. Mondok's return to celebrated Sel Gris-style plating and ambitious attention to detail garnered accolades from Food & Wine and GQ Magazine, while serious service flaws and staffing gaffs put a muffler on the eatery's success. Opening sommelier/manager Brandon Tebbe quietly split ways with the restaurant within a few months of opening, leaving behind a sprawling wine list rife with typos and a staff largely unequipped to explain the selections. The much-hyped on-site farm also got off to a slow start. Though the kitchen remained committed to sourcing locally, early promises of livestock and produce sourced from a farm managed by Paulée haven't yet materialized. According to new Executive Chef (and restaurant partner) Sean Temple, it's still in the works: "You'd be hard pressed to find a farm anywhere that is in full production after a start in late May. It is definitely a large project, but I can say we are very happy with what we have yielded since the restaurant opened. By the time things were really producing for us in late summer, we had a hard time keeping up with using it all. We didn't buy any squash, cucumbers, pole beans, tomatoes, herbs or greens for over a month." The restaurant is owned by the group that also oversees the Inn at Red Hills, the hotel where Paulée is located. Temple explains Mondok and Paulée's ownership "had a difference of opinion on the future of the restaurant," but declined to give further details. Mondok could not be reached for comment, but a representative for Paulée says he doesn't have a formal plan for his next step. What's next: Temple reports the space "will keep putting out food on the same level as before" but will add a casual bar menu to attract more neighborhood regulars. "We realize we cannot just be that special dining destination spot, but have to be more of a daily or weekly spot as well." Despite Paulée's reputation as Mondok's creation, the menu was a collaborative effort from the start. "That was and is the greatest thing about working here at Paulée," says Temple. "There is no 'this is my menu' mentality. It started with Daniel, who was always really inclusive, and there have been a number of times since we have been open that half the dishes on the menu were mine. My sous chef Gabriel Pascuzzi [who has worked at DB Bistro and Colicchio and Sons in NYC] has had a number of dishes on the menu as well, and we've even featured dishes from line cooks." The restaurant's sourcing is still just-down-the-road fresh. "We get our cheese from Briar Rose up the road from us," shares Temple, "and they give their whey to Worden Hill, who we get half our pigs from, then we in turn give all of our food scraps every couple days to feed those pigs. I get to stop on my way into work at Simmington Gardens and pick up his killer salad greens every few days, and we hand pick our own veg out of the ground over at Kookoolan Farms." As for the Paulée-run farm? Temple isn't giving up hope: "Do we expect to be completely sustainable? Not by any means, at all. Do I think it is an aspect that can set us apart from other restaurants? Definitely. There will always be a learning curve, as farming is new for all of us, but you can't say you did something if you didn't even try." Though no major dinner menu shifts are planned for now, questions of the restaurant's direction remain. Will modernism still have a home in the valley? Or will the space be another tally in the column of ambitiously technique-driven restaurants that bend to the wishes of neighborhood diners? At the end of the day, we certainly can't say Mondok and Temple didn't try.